Hard to believe, but Thanksgiving is only 2 weeks away! Here’s an adorable little treat that would be a PERFECT addition to a bowl of vanilla ice cream. It’s a light dessert after what’s bound to be the best meal of your life…at least that’s how I feel every year! 1. Twist open the Nutter Butter cookies and remove the peanut butter filling. 2. Melt the chocolate (about ½ cup) and let cool to room temperature. 3. 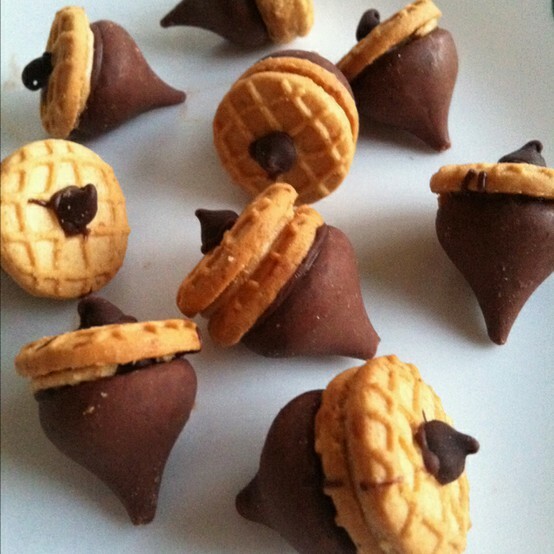 Using a piping bag or a knife, place a small amount of peanut butter on the Nutter Butter cookie. 4. Working quickly, dip the bottom of the Hershey’s kiss into the melted chocolate and attach the cookie to the kiss, peanut butter side down, so the chocolate and peanut butter melt together. Repeat for as many acorns as you need. 5. Place remaining chocolate in a piping bag and create little stems on top of the Nutter Butter cookies. Toss 2-3 acorns in with a bowl of vanilla ice cream and you’re good to go! This is absolutely adorable!! Thank you so much for sharing! my pleasure! I’m so glad you liked it! haha! Thanks! I’m glad you liked them! Going to make these for Thanksgiving! Instead of scraping off the filling, etc., what about sticking the kiss on with a dab of chocolate frosting, and sticking a chocolate chip on the other side? Hmm…they used to make little butter cookies that might work…otherwise you could make a sugar cookie batter and make your own small cookies! Use a lipstick top or other small round to cut out the cookies and bake them at about 325 for 5-10 minutes. Be sure to watch them carefully since smaller cookies will bake faster. If you could find mini vanilla wafers, those might work as well!